Tuesday at 5.30 p.m., along with hundreds of my fellow citizens, I attended a rally at the shore of False Creek, our local arm of the mighty Pacific Ocean. It was a beautiful summer evening, the warm sun bathing the grass where we stood or sat listening to numerous Indigenous speakers proclaiming that this is their unceded territory and that the federal government has no legal or moral right to ram through a pipeline without their consent. Despite his promises to open a new chapter in the Truth and Reconciliation process, Prime Minister Justin Trudeau has clearly failed to respect First Nations and their concern for the land. In addition, he has violated his promises in Paris to place Canada in the forefront of efforts to halt climate change. Instead, he has magically found 4.5 billion dollars to buy a pipeline from a private corporation who feared the venture might not produce sufficient return on their investment. 4.5 billion dollars! Your dollars and mine, suddenly available to a government that only last summer could not find a lesser amount to ensure safe drinking water for all Indigenous people whom previous governments had moved to reserves so that we, the immigrants to this country, might buy and own their land as our own private property. 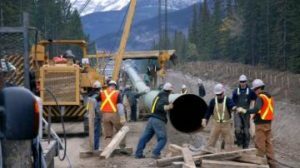 Beyond that, an additional 7.5 billion (already being cited as a minimal amount that does not take “the unforeseen” into account) will be needed to pay for the actual construction of a pipeline to transport unprocessed bitumen to foreign lands where it will be processed into a “useful” form that includes a range of petroleum and plastic products. Those who applaud the fact that seven times as many freighters will be passing under the Lion’s Gate bridge on their way to these foreign lands assure us that accidents never happen, that captains never get drunk before their shift, and that the possibility of human error need not be taken into account even though scientists have no idea how or whether a major bitumen spill could ever be cleaned up. I live in B.C. by choice. I recall the moment I first stood in Stanley Park, gazing across the water at mountains that lifted my gaze skyward. It was and is a sight more awesome than words can convey. I also recall walking across the sand to the water’s edge, marvelling that there was no rim of dead fish as there had been along the shores of Lake Ontario where we swam in my childhood. Back then, blankets and towels were always spread a respectful distance from these rotting corpses. Having opted for B.C, I must now accept responsibility for protecting and preserving its magnificent beauty. Future generations deserve to stand where I once stood. Still, hope springs eternal in this human breast. I strongly believe that we can do better. I believe that Canadians can envisage work that is satisfying and remunerative without being destructive. I was delighted to see so many young people head to Tuesday’s protest rather than rush home for dinner after work. I was delighted to see many grey-headed elders as well. It was my first experience of being notified via social media of a same-day event where my presence was needed. For many, and especially for parents with young children, participation was not possible. However, I do wonder whether more elders might have foregone their usual routine at the dinner hour, and whether instead, they could have added their voice and their energy. I grabbed a snack and my water bottle as I headed out the door, and then sat comfortably on a bench while listening or while adding my voice to the cheers and jeers the speakers’ words evoked from the crowd. I’m so glad that I made the effort to attend. I’m so glad to be a participant in the dialogue we must have as a country. This dialogue, and many others. That is my privilege as an elder. Next time, will you be joining me? How will you add your voice and make your opinion known to the decision-makers?